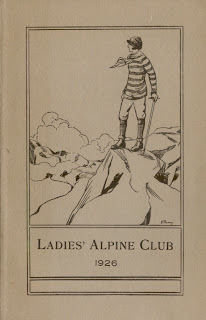 I have in my possession a series of Ladies' Alpine Club Yearbooks. They really are thrilling as they show the development of the club at a time when women were really taking themselves off to the hills, ditching their skirts to wear breeches, and leading groups of men and women on difficult climbs all over the world. Along with articles written by members, there are other sections of interest. My favourite bits are the minutes of their meetings, information on the Club Room and Club Badge, details of climbs and expeditions completed by members and the full list of members with their addresses in each journal. Miss HILDA HECHLE - Scrambles for painting purposes at Pointe d'Orny,Aiguille du Tour, Catogne, Fenetre d'Arpette and Cabane de Bertol. Now, I failed to mention previously that the Ladies' Alpine Club yearbooks also contain a section called The Picture Exhibition. Every year they would create an art exhibition of their lovely paintings. I decided to check to see if our 'Miss Hechle' scrambled, painted and then exhibited, and sure enough she did. Her scrambles seemed to pay off as she submitted 3 paintings that year. The shadows she painted on the snow were said to be 'very luminous'. It seems the Ladies' Alpine Club art exhibitions were rather fashionable as in the 1926 journal, an extract from The Times is reprinted. Miss Hilda Hechle is referred to as taking the lead in the exhibition. 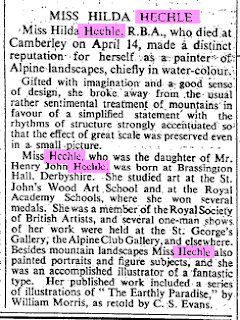 She is accused of 'stylising' her drawings a bit, but it also comments that "there is every evidence that Miss Helche is constantly "feeding" her decorative ability by direct - and enterprising - contact with the subjects". After a year not scrambling, she then went sketching in Switzerland. It appears she had to abandon a climb because she hurt her knee. The climb was not wasted as she decided to sketch for some hours instead. 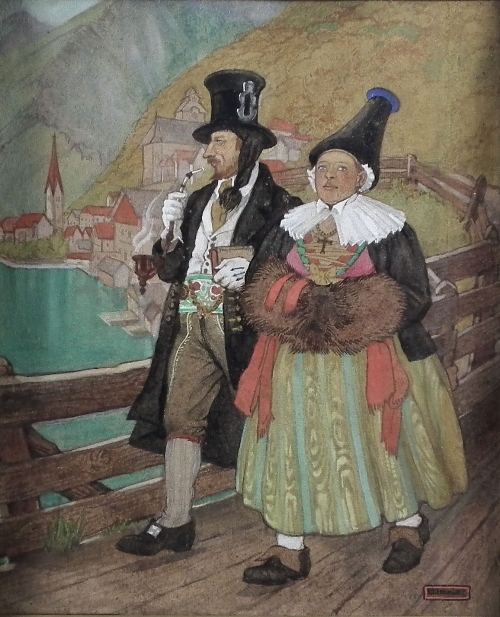 The next art exhibition is again reported in The Times and Hilda's paintings of Wales and The Alps are again seen as 'decorative' and her manner of painting the people of the mountains is felt to be like Hans Anderson. 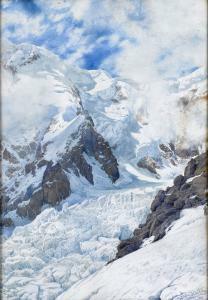 In the 1929 exhibition Hilda only exhibited one painting, The Ortler, and it is reported that people were disappointed she had not included more pictures. She had, however, gained three initials after her name: R.B.A because she was now a member of the Royal Society of British Artists. She entered one painting for the exhibition in 1930, but her name is not in the list of members. 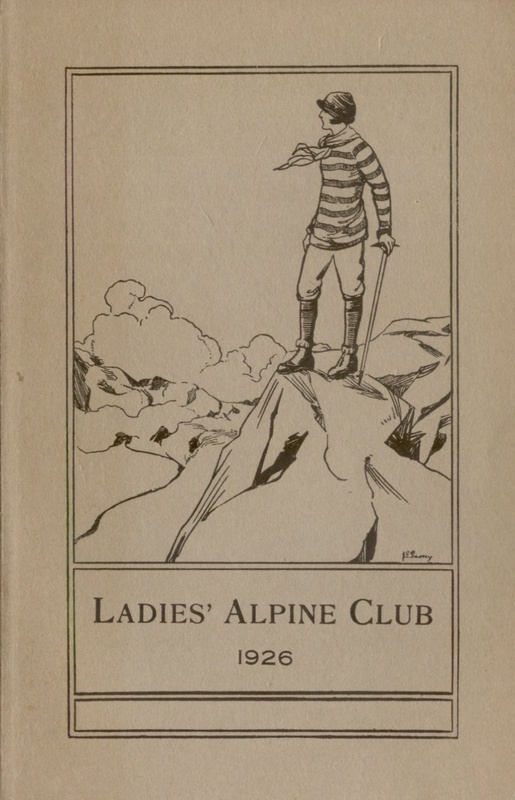 In the following year she did not enter anything, and The Ladies' Alpine Club clearly felt there was something missing that year. She seems to have faded away after that. So, who was Hilda Hechle? Wow, what a treasure and such an interesting post! Thanks so much for sharing! You lucky thing! Her mountain paintings are lovely. If you ever find out more about her than I was able to, please let me know. Thanks for visiting and commenting.